Peter Laviolette recently led the Philadelphia Flyers to a Stanley Cup Finals appearance as head coach after spending parts of five seasons as head coach of the Carolina Hurricanes (2003-04 to 2008-09), where he compiled a 167-122-34 record in 323 games. In 2005-06, he helped the Hurricanes set franchise records in wins (52) and points (112). In the 2006 Stanley Cup playoffs, Laviolette guided Carolina to a 16-9 record and its first Stanley Cup Championship. He was also named a finalist for the Jack Adams Trophy as NHL Coach of the Year in 2006. 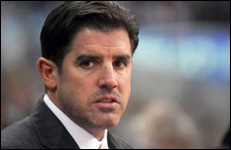 Prior to joining the Hurricanes, Laviolette served as head coach of the New York Islanders for two seasons (2001-03). He registered a 77-62-25 regular season record and led the team to Stanley Cup Playoff berths in both seasons. Prior to serving as the Islanders head coach, Laviolette served as an assistant coach with the Boston Bruins in 2000-01 after serving as head coach of the Bruins’ American Hockey League affiliate, the Providence Bruins, for two seasons (1998-99 to 1999-2000). Internationally, Laviolette was the head coach for Team USA at the 2006 Winter Olympics in Torino, Italy, and was also head coach for Team USA at the International Ice Hockey Federation World Championships in 2004 and 2005, guiding the U.S. squad to the bronze medal in 2004. He has also served as an assistant coach for Team USA at the 2004 World Cup of Hockey, where he helped lead the U.S. to the semifinals. As a player on the international scene, Laviolette appeared in the 1988 and 1994 Olympic Winter Games as a player, serving as captain of the 1994 Olympic squad. A native of Franklin, Mass., Laviolette was born on July 12, 1964, and played 11 seasons of professional hockey, mostly in the AHL and International Hockey League, and appeared in 12 games with the New York Rangers during the 1988-89 season.